FAE is a web-based fine art marketplace designed to sell artists' estates and private or corporate collections while providing each buyer unprecedented transparency into the sales process. FAE provides transparency because our unique, timed schedule of discounting is published on the website, which provides all buyers access to the same information and allows them enough time to make thoughtful, unhurried purchases. FAE offers only original paintings, sculpture, drawings, fine prints, and photographs, which are placed on the FAE site by a national network of professional art dealers who have been granted access because of their experience, expertise and integrity, and who select artwork based on quality and condition. Who is FAE Designed for? 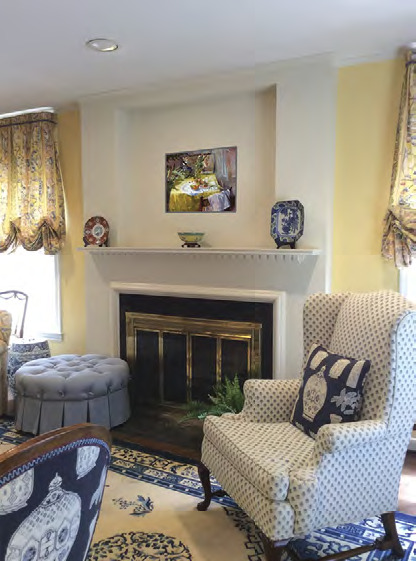 Simply, FAE was designed to be an indispensable all-inone website for interior designers, art consultants, and architects to find, track, and acquire fine art for their clients. FAE has created a totally integrated combination of tools, alerts and apps that, in addition to keeping up with artworks of interest, allows them to be placed in user-created and defined projects. FAE has carefully incorporated enhanced search capabilities and provided multiple sort and filter options to arrange artworks and projects at will. Also, by providing multiple ways of accomplishing almost any action on the site, FAE has empowered each user to be creative. Unique apps are provided that allow a user to generate a View, the virtual installation of an FAE artwork onto a wall in a room of a client's home or office, in proper scale and perspective. All of these tools come together on the site's Projects page, where professionals can keep up with all of their clients' fine art needs, and, most importantly, FAE's Serrace Sales System allows them to meet or beat their clients' budget every time. The most innovative aspect of the FAE website is the Serrace Sales System. 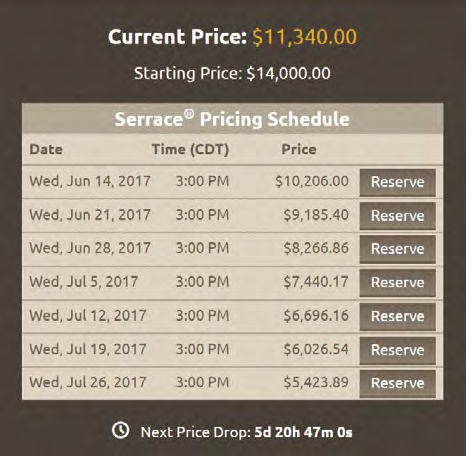 Instead of using the fixed price method, or the auction sales model - where prices start at the lowest acceptable selling price and are bid up within a brief time frame - Serrace takes an entirely new approach. Serrace places each artwork online at its full retail price, holds it there for a prescribed period of time, and then, on a published schedule, systematically reduces its price until the artwork sells, or is about to drop below its lowest acceptable price. To keep the system as transparent and democratic as possible, up to seven price drops of the Serrace discount schedule are published so all potential buyers have equal access to the same pricing information. This approach allows buyers to make thoughtful purchase decisions, but, by waiting too long, buyers could risk losing the artwork that's under consideration to someone else. By placing an FAE Live View Target on the wall where an artwork is desired, the FAE iOS app allows the user to select an artwork from ArtTracker (FAE's favorites list), hold the device so the target appears in the view screen, and instantly see the artwork superimposed over the target on the screen in proper scale and perspective from most anywhere in the room. The combined image can be captured and uploaded to the My Views area of the FAE website or shared. The desktop app uses JPEG format images of rooms with a special FAE Rooms Target placed where an artwork is desired to facilitate the creation of editable Views. These room images can easily be added to the My Rooms area of the site using the Add a Room uploader. From there, the images can be used to create editable Views in the My Views section of the site. The user is then able to adjust the artwork's perspective and brightness level, as well as the brightness level of the room image if necessary. A simple frame can also be placed around the artwork image and its color changed by selecting from a pop-up palette. If the image is taken with an iPhone or iPad, the desktop app will allow the user to seamlessly capture and name the room image, assign it to a Project, and handle the upload process directly to the FAE site. On the Browse Art page of the site, the user can create a complex personalized search using FAE's Guided Search feature. If an initial search does not provide the desired artwork, the user is able to name and save the search, assign it to a Project, and schedule an alert to automatically rerun the search periodically. The user will be informed via email and by text when new works that meet the saved search criteria have been added to the FAE site. For instance, by setting and saving an Alert on a named search, a user who is interested in still life paintings created in France between 1800 and 1900 will be contacted when new works of that description are added to the FAE site. Multiple alerts can be set for each artwork on the site. By clicking on the alarm clock icon beneath each artwork thumbnail, one or more alerts can be activated that will let the user know via email, and by text, if applicable, when a work is about to drop in price, if another user places a Reserve on a work, or if a work has reached its final Serrace price level. In addition to forwarding artwork, Room, and View images, it is easy to cut and paste any image or copy and paste any text into PowerPoint from FAE to make quick and exciting presentations for clients. The result of all of the time spent measuring, scaling, and combining images in photo editing programs is now easily accomplished by simply creating Views within the FAE website. FAE offers a seven-day, money back guarantee. As long as the buyer informs the Dealer of the intention to return the artwork within 7 days of receipt, and it is returned to the Dealer in its original condition within 14 days of receipt, FAE will refund the buyer's payment, less a small restocking fee, in accordance with the FAE User Agreement.